When Ricky Gervais hung up his Golden Globes hosting shoes in 2012, it felt like he had grown tired of the gig and the controversy it inspired, especially given the increasing pressure he was under to offend, yet simultaneously charm, Tinseltown. Whether he returned this year to outdo outgoing hosts Amy Poehler and Tina Fey or because he felt armed with a new bag of punches isn’t clear. But he was funny and mean enough to enliven a pretty dull night. He tackled everything from Sean Penn‘s El Chapo interview and Caitlyn Jenner to the inequality of women in Hollywood and Jeffrey Tambor in a dress. It was exactly as Gervais kept insisting: He really didn’t give a crap. And what a heavily bleeped party it was. Jonah Hill and Channing Tatum reenacted the bear attack scene from “The Revenant,” making inaudible jokes that only the live audience heard, thanks to NBC-imposed silences. There were many more censored moments that couldn’t help but make those at home feel left out. Sylvester Stallone and his “imaginary friend” were a highlight, thanks to an impromptu standing ovation. (Deserved, considering he never won for “Rocky.”) Most who accepted their awards simply read off a list. Sometimes, in the case of Ridley Scott, they read them well past the cutoff music. There were no dramatic Jodie Foster or Michael Keaton moments to speak of. 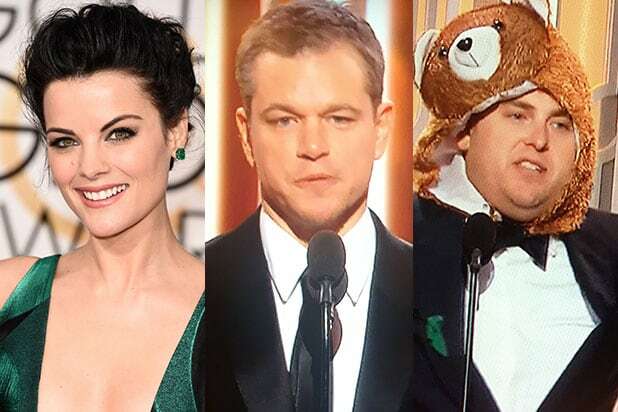 There were blips of drama here and there, as when a teleprompter went down and “Blindspot” star Jaimie Alexander swore alongside Amber Heard. And Eva Longoria and America Ferrera delivered a pointed riff on the fact that the Golden Globes mixed up Ferrera and Gina Rodriguez’s names during this year’s nominations. The funniest moments came from the reactions, such as Matt Damon‘s sheepish response after Gervais introduced him as the only partner Ben Affleck had never cheated on. Aziz Ansari held up a “How to Lose Gracefully to Jeffrey Tambor” book when the camera panned to him. But for all of those glimmers of hope, there were plenty of lows. Melissa McCarthy and Jason Statham couldn’t liven up the broadcast with a tired “Spy” bit; Jamie Foxx pulled his own mock-Steve Harvey moment; and Quentin Tarantino should probably never use the word “ghetto” again. 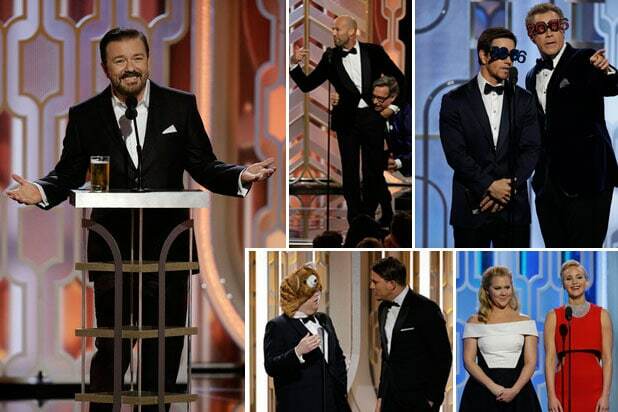 The Globes made some of the same old broadcast mistakes, such as spending just a little too much time revisiting the film nominations for best comedy and drama through pointless vignettes. If you’re tuning into the show, odds are you have a base knowledge of the movies nominated. With “Trainwreck” and “Joy,” it was obvious the Golden Globes just wanted to take the opportunity to showcase Amy Schumer and Jennifer Lawrence together. But if the duo’s introduction was any indication of how their film project will pan out, it might be a hard pass. In the end, the show suffered from not enough Gervais, and from too many other people trying to be him. With the show already clocking in at three hours, more Gervais isn’t the ticket to solving the inevitable boredom that settles in around the two-hour mark, though — especially if it means more bleeping alongside the likes of Mel Gibson. Getting rid of ancillary categories (or relegating them to off-camera presentations) would make sense. But then again the Golden Globes are all about self-aggrandizing the Hollywood Foreign Press Association. These guys would never pass up an opportunity to spend a little extra time showcasing their reach. In fact, this show would probably be four hours if NBC allowed it. Instead, it only felt that way.